It looks like the last of April's showers have come and gone, just in time for May's flowers. It's also time for many wineries, distributor and retailers to promote the newest selections from 2010 and what better way to promote the "newest" vintage than the upcoming "Earth-day" celebration this coming weekend. Yes folks, Earth Day Food & Wine Festival is nearly here, this coming Saturday in fact. It's a great place to bring the kids, while the adult slurp on adult grape juice. It's also a great opportunity to meet more than 200 purveyors of sustainably produced foods and wine who will be on hand to captivate you with a taste of the sustainable; for a truly unique event. Although no tie-dyes are required, feel free to hob-nob with the greenest folks on the planet, meet SIP certified growers, vintners and have fun interacting with other like-minded vino-sapiens. If you'd like to find out more about what's going on this weekend for Earth Day, please click here and you can find out what kind of person brings an Owl to a wine tasting. In today's Wine of the Week feature; SIP Certified Riverbench Pinot Noir, a winery located on the historic Foxen Canyon Road, in the Santa Maria Valley, relatively a stones throw from downtown Los Olivos. Where if you've seen the movie, you may recall Miles [Sideways] had his meltdown about not wanting to drink any F-ing Merlot just outside the Los Olivos Cafe. If you have never been to this area, folks you're seriously missing the boat, in so many ways. Especially so for you Orange County folks, c'mon Temecula is a waste of time, get yourself on up to Solvang where you're just minutes from some of the best wine in California, once there grab a few dozen of those tasty Ebelskiver's from the sidewalk window and then hit the wine trail. 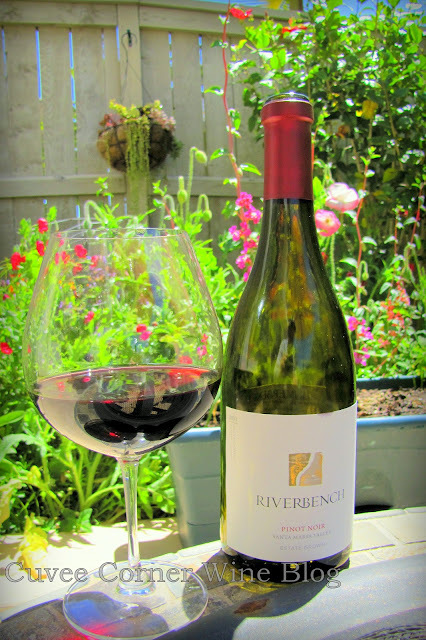 Back to the wine in today's review spotlight; the 2010 Riverbench Estate Pinot Noir, produced exclusively from Santa Maria Valley fruit. An area planted primarily to Pommard, Martini, and Dijon clones, it is everything you're looking for and more. That's if you like fruit forward wines that taste more like the grapes that grew on the vine, than the dirt they were grown in or the barrels they were in aged in. In the glass you'll find a very bright cranberry colored core, very light and lean in color. The nose is chalk full of very expressive scents of bright cherry, summer fresh raspberry, a newly opened coke and a hint of smokiness. On the palate, or after the initial splash down, boat loads of bright strawberry, raspberry spread over a freshly toasted English muffin, with a spot of tea. The tremendous weight of the fruit is amply supported by the wines bright and vivid acidity, the finish just goes on and on. I had not finished the wine on first day, so I resorted to the vacu-vin, and the wine held up nicely to the second day after being uncorked. This is the kind of wine that will play nicely with many different dishes, aka very food-friendly. This is the kind of wine for folks who like to taste a bit of the fruit, surprisingly from which the wine was derived from in the first place. But for those of you who are not flattered by the kiss of rich red fruit, who dig the taste of thrice used barrels, stems and twigs, well you'd better look away, before it's too late, this wine is California Pinot Noir all the way. This wine is made in a drink now and drink often style, it sells for a SRP of $28 and I gave it a score of 90 points, it's highly recommended. That's all for today folks, I hope you can make to this weekend's Earth Fair celebration at the SIP Certified Pomar Junction Vineyard & Winery in Templeton. Until next time folks, sip long and prosper cheers!